Scene and summary are the key building blocks of any novel. Some novelists devote more of their page count to scenes. Other writers use fewer scenes and more summary. Sometimes, publishers want writers to cut a book’s length, and writers are forced to compress moments in the tale when they might have wanted to let the clock tick in real time. There are many ways to tell a story. What you emphasize and what you skim over is up to you, but don’t let your decision be accidental. Make conscious decisions about scene and summary. Let’s get clear about scenes, and then take a look at summary. Plays are written in scenes. Characters come onstage, and speak and interact in real time. When the action is being “dramatized”–meaning events are taking place while we’re watching them–we are like the audience in a play. As the tension ramps up, the audience must decide which characters are good or bad. We must deduce motives. The effort to figure this out keeps our attention on the actors’ body language and dialogue. Several scenes make up an act. Each act builds to a climax: a game-changing development. 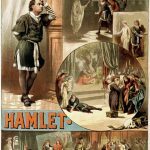 Let’s take Shakespeare’s Hamlet as an example. The first scene takes place on the battlements of Elsinore castle. Although Prince Hamlet is the main character (the protagonist), he does not appear in the first scene. All the action takes place between the watchmen, who summon Horatio, Hamlet’s friend, to witness the apparition of the dead King. In Scene 2, the new King–Claudius–holds court, and Hamlet, the Prince, is just one of the matters the King must deal with. But he does deal with the issue that carries forward from the first scene, namely the ghost of Hamlet’s father, lurking around the castle. Claudius deals with this issue by chiding Hamlet for wearing mourning clothes. Plot is the emotional baggage carried from one scene into the next. Think of a scene in fiction as one of the building blocks of your novel. Each scene must reveal new information or show a different side of the character. If you can truly place a character in a scene and bring him alive, your readers will remember those moments, just as they would remember an actor on a stage. That’s not the only reason scenes are good. Scenes also allow you to build in complexity so the character isn’t one-dimensional. What is the one thing your character wants? You should definitely show that in scene. But, also write a scene that dramatizes the character wanting the very opposite of that. Why? Because if you can “dramatize” both things, then the audience will “get” that the character is conflicted. In the novel I’m working on, the fifteen-year-old protagonist wants to take a shortcut to fame and fortune. An orphan, he yearns for a father figure to protect him. However, he often goes of half-cocked and believes he’s old enough to make his way in the world. Two scenes at the beginning of the book dramatize his inner conflict. One shows the first characteristic, and the other scene shows him acting impulsively. I’m hoping readers will understand that he can’t reach one goal without sacrificing the other. Use scenes to give your book some preliminary shape. I shoot for 35 to 40 scenes. That’s so I can write scenes of 10 to 12 pages. I use Scrivener to block them out. But, that number isn’t writ in stone. Author Randy Ingermanson says that 50 to 200 scenes constitute a novel. With more scenes, the page count for each scene goes down. In his book Story Physics, author Larry Brooks talks about how the number of scenes affects the pacing of the plot. He has created this helpful graphic on scenes and dramatic structure. To keep the novel from sprawling all over the place without a plot, Brooks advocates outlining. Not everyone wants to do an outline, but at some point, mapping out the major scenes can be a big help. If you’re a first-time novelist, about 50 to 80 pages into the book, you may have a panic attack. “Oh, my gosh. I have no idea where this is going.” Don’t give up. This is your discovery draft, and it’s entirely possible to write an entire draft and then begin to construct a plot. If that frightens you, then try this approach. Figure out a preliminary destination. How will the character change from the beginning of the book to the end? In Gone With the Wind, sixteen-year-old Scarlett O’Hara is avid in her pursuit of Ashley Wilkes, and she will stop at nothing to win his love. After alienating the one man who could stand up to her–Rhett Butler–she ends up alone, but with her plantation Tara. What are the main scenes that constitute Scarlett’s journey from Southern belle to a woman who must live with the consequences of her choices? Imagine the movie, or even better, watch it, and make a list of the scenes. What will happen to your characters? In which scenes will they confront their own illusions? When will they stand at a fork in the road? Where will make moral choices–decisions that will haunt their consciences or turn them into different people than they were at the start of the book? What will they win? What will they lose? In summaries, the ticking clock speeds up. A summary can cover months or years. Because of that, summary is an efficient way to move the story forward. Passages of summary also provide a needed break. Readers grow weary if confronted with too much dialogue or too much heart-racing action. In the writing sample below, imagine how many scenes would have been required to convey the same information—the father’s disdain, the mother’s repeated efforts to learn to ride a bicycle, and the child’s shifting allegiance. And notice how efficiently this summary passage allows the author, J.M. Coetzee, to bring in elements from the past. At first he had thought it splendid that his mother should have her own bicycle. He had even pictured the three of them riding together down Poplar Avenue, she and he and his brother. But now, as he listens to his father’s jokes, which his mother can meet only with dogged silence, he begins to waver. Women don’t ride bicycles: what if his father is right? If his mother can find no one willing to teach her, if no other housewife in Reunion Park has a bicycle, then perhaps women are indeed not sup­posed to ride bicycles. Alone in the back yard, his mother tries to teach herself. Holding her legs out straight on either side, she rolls down the incline toward the chicken-run. The bicycle tips over and comes to a stop. Because it does not have a crossbar, she does not fall, merely staggers about in a silly way, clutching the handlebars. His heart turns against her. That evening he joins in with his father’s jeering. He is well aware what a betrayal this is. Now his mother is all alone. Nevertheless she does learn to ride, though in an uncertain, wobbling way, straining to turn the heavy cranks. In the most basic sense, summary passages require the writer to confront the issue of “show don’t tell.” Showing is what authors do when they write dramatic scenes. Telling is what happens in summary passages. To be effective, summary passages must provide detail so the reader can visualize what the character is hearing, smelling, and experiencing over a period of months or years. The passage below covers an entire summer. Notice how the passage has a plot. The “I” narrator shows us the reality of the meatpacking plant. At the end of the passage, we learn that, all this time, the narrator has had a draft notice in his pocket. All of the above possibilities could have been dramatized and shown in real time–meaning “in scene.” Instead, this passage speeds through the summer before the narrator goes to Vietnam. That’s because the author knows the important scenes will take place over there. He doesn’t want to squander story space by putting undue emphasis on this summer. Sometimes, passages of summary should be dramatized—written in scene. The emotional impact is greater; plus, readers are more likely to remember dramatized scenes than passages of summary. A child’s Teddy bear in the “exclusion zone,” part of the Chernobyl disaster. A breeze blew up from the river, rustling the grass and swaying the sign that leaned in the middle of the field, its red warning chipped and peeling. “Yuuuulia!” Mama cried, brandishing her ax in greeting. She and her friend Ganna, their aprons filled with pine branches, met me in the field. They smiled, wide and gap-toothed, squinting in the cool sunlight, their soft fat faces framed with kerchiefs. They were waiting for me to touch them, a kiss or a pat, but I hesitated, and the moment passed. “Ganna, take some of these logs I’ve brought Mama,” I said. But they had begun to divvy up their branches, each scolding the other for not taking her fair share. Inside the house, I stacked the logs by the stove. “I’ve got a perfectly good forest in my backyard, and you bring me fire­wood,” Mama complained. She made me a cup of tea and examined my loot, grunting her approval at the sausage links, the bag of sugar, and the box of tea. “Enough for a dress,” I said, unfolding a length of flowered fabric. The white material shone like a beam of light in the run-down house, where the teacups were stained brown and wallpaper roses were buried beneath a layer of grit. “Mania, you know I won’t eat that,” I said. See how much more effective scenes are in making you, the reader, feel like you’re right there? Pick up a book–any book–and flip the pages. Which pages are dialogue heavy? Those are the scenes. Where you do find long passages of text? Where does the author speed through time? Most likely, those are passages of summary. Think of this as a teeter-totter. If you’re writing conventional fiction, not an experimental novel, you’ll want to make conscious choices about which scenes to use and how to handle summary. Maybe, when you’re staring at that stack of paper, you’ll see possibilities for condensing some of your scenes into efficient, emotion-packed summary. And, stay tuned. Later on I’ll be talking about another technique–the half-scene. As you might guess, half-scenes combine scene and summary; but done well, they provide the illusion that the reader is experiencing the story in real time.